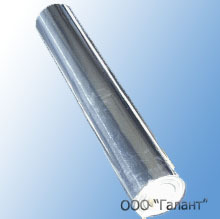 FL-A Thermal Insulator is a combined material consisting of 20 µm aluminum foil reinforced with 20 µm PET film. FL-C Thermal Insulator is a combined material consisting of 20 µm aluminum foil reinforced with 20 µm PET film with the permanent adhesive applied from the side of the PET film and covered with the antiadhesion layer pad. material is resistant to corrosion, corruption and ultraviolet radiation.